The rivalry between Belfast Celtic and Linfield was deeply rooted in the red-bricked, segregated terraces of the mill streets of the city. The wearing of the green of Celtic or the blue of Linfield gave away immediately a person's religion and political affiliation. Linfield drew their support from the staunchly Protestant Village and Sandy Row areas, which lay adjacent to the Catholic areas on the Falls Road near Celtic Park. The 'Blues', as Linfield were known, were the epitome of the Unionist cause, it was said that no Catholic ever wore the blue shirt nor was employed in the back rooms of Windsor Park. The fact was that both teams represented the religious factions of Belfast and the rivalry was an expression of supremacy and territory. 'Home Rule means Rome Rule' was the cry of the fundamentalist street preacher and sport and politics would inevitably collide in the circumstances. 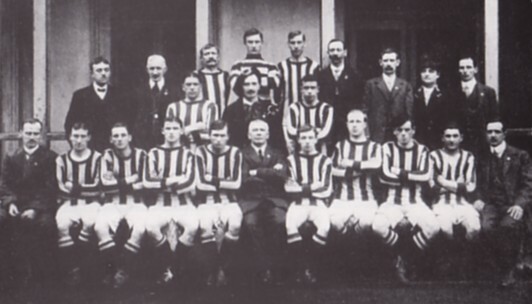 The political situation was critical across Belfast as the 1912/13 local football season kicked off in mid-August. With the prospect of Ulster Day on the horizon, the clash of Belfast Celtic and Linfield at Paradise on 14 September was seen as a potentially dangerous affair. However, what happened at Celtic Park that day caught the police and the authorities cold as the violent political and sectarian undercurrents of the day surfaced in west Belfast. The preview of the game in that day's Irish News displayed no concern at the potential for trouble at Celtic Park. A 'great match' was expected with the all the indicators pointing to some 'genial weather'. Indeed spectators at the ground that afternoon were, it was rumoured, to be treated too a fly-over by 'those two daring aviators Astley and Valentine'. In largely ironic words, the reporter went on to suggest that that 'there could be no better selection for those two daring birdmen than Celtic Park in 'delightful weather'. Nothing has been recorded as to whether the two pilots arrived over Celtic Park that day. Should they have undertaken their fly past, what they may have witnessed might not have been what they had expected. The fact was that by three o' clock on a fine autumn day, a crowd of twenty thousand was assembled in the ground. A majority of the spectators came in anticipation of a close contest but for a significant majority a more sinister plot was in mind. As the crowds had gathered in Celtic Park, in the more salubrious surroundings of the Belfast suburb of Balmoral, twenty-thousand spectators attended the aforementioned air show which was, indeed, headlined by the famous duo of Astley and Valentine. The attendees were reported to have ‘got their money's worth’ by the display with some even paying the 'steep' price of four pounds to sample the delights of flying. On the leafy middle-class avenues of Belfast, life went on regardless and oblivious of the sectarian battle that was about to rage not two miles away that afternoon. What was reported on the actual game on Monday was scant in the extreme. It was, according to the Belfast Telegraph an 'exciting match' with 'both teams living up to their reputation as cup fighters'. The real fighting though took place on the terraces of the ground as sectarian spite took control. Traditionally, when Linfield came to Celtic Park, the Blue's supporters congregated on the Donegall Road side of the ground, while the Celtic fans were drawn towards the Falls Road end. An uneasy peace existed in a 'neutral zone' where the less vociferous fans mingled. The flying of flags and the singing of sectarian 'party songs' were part and parcel of a Celtic Linfield clash. Indeed, the Irish Weekly and Ulster Examiner reported that: 'for nearly a full hour on Saturday before the final outbreak of turbulence and cowardly violence at Celtic Park, a crowd numbering many thousands gave vocal expression to their feelings; and the language used by many hundreds among them - young boys, fully grown men, and not a few greybeards - would have shamed the denizens of Dante's Inferno'. This was an unacceptable, but expected, aspect of clashes between Linfield and Celtic, where the Pope in Rome was cursed a thousand times and the Royals of England were afforded similar sentiments. However, there was a hidden political agenda in the ground that day and, unusually, it was in the so-called neutral zone that the trouble erupted. How the disorder started was of course the source of much speculation, with each faction blaming each other as usual. What is known is that at some stage during the half-time break, two 'lads' got involved in a nasty fight in the packed neutral end of the ground. This soon degenerated into a free for all between rival supporters and amid the chaos - described by the Irish News as 'a kicking match without the ball' - a shot rang out. Stunned, the crowd turned as one to where the noise had emanated from when a second round was discharged. A cry went out that someone had been seriously injured as stewards were seen carrying a man away from the enclosure. The net result was that the eight-thousand Linfield fans and the ten-thousand Celtic fans were convinced that they were under attack from each other. In such circumstances, the inevitable happened - a riot broke out. The referee that day was a Mr. G. H. Holmes, who had travelled to the game from Stockport. As he enjoyed his half-time cup of tea with his linesmen, a stone smashed through the dressing room and landed at his feet alerting him that all was not well in the ground. The noise in the ground worsened as screams of pain and oaths of hate were heard. As the rioting worsened, Holmes was astonished to discover that the Celtic and Linfield players wanted to resume the match as such occurrences were 'commonplace' at local football. However, a further shower of stones, together with the sound of more gunfire and the sight of four policemen laid-out on stretchers, soon put an end to any such notions. After the second burst of gunfire, fans from the Linfield end spilled onto the track around the pitch in an attempt to get at the Celtic supporters. The Belfast shipyards were always a great source of ammunition and missiles in the form of nuts, rivets and bolts - Belfast Confetti as it is known - was exchanged as the trouble worsened. The players and officials stayed in the pavilion as police reinforcements arrived to deal with a situation that was chaotic to say the least. A further burst of twenty shots had thousands of spectators crouching for cover, while those with a survival instinct headed for the gates. Eventually, the police managed to push both sets of belligerents back over the barriers as the Linfield fans turned and attacked the mixed enclosure on their side of the ground. Fists, flying boots and hand-to-hand fighting ensued as the police tried to stop the mobs. Finally the authorities managed to push the rioting Linfield fans out of the ground to the Donegall Road where the destruction continued with trams being wrecked and bystanders assaulted. Brawls between the police and the Linfield supporters spread to the near-by Bog-Meadows and the bad nature continued for many hours on the streets of the Village district. After a brutal and blood-soaked period, the police succeeded in securing calm in the vicinity. The home enclosure at Celtic Park lay in ruins with broken glass and debris strewn over the terracing. Many spectators had been 'split' by the flying 'confetti' and word spread ominously across the city of the chaos which had reigned. At the Royal Victoria Hospital, the walking wounded were attended to as panic gripped the streets with the rumour mill working overtime. Crowds gathered also at the Mater Hospital as a procession of bloodied spectators arrived by cart and by foot. The bloodied ones were stitched and bandaged as it was reported that 'Professor Campbell and Dr. Miller were full engaged with their competent staff'. The Belfast Telegraph that Monday listed some of the names of the wounded, their addresses and their injuries - Albert Milligan of Roden Street obtained a fractured skull, John Trainor had a deep scalp wound, while Thomas Gillespie had sustained a severe gunshot wound to his right hand and ear. The Irish Times reported that five men had been taken the city's main hospitals suffering from gunshot wounds. A further sixty spectators had required treatment by medics in the ground where ‘men had been knocked down and trampled underfoot by the fleeing crowds’. Despite that fact that the game had been 'keenly contested' the trouble was totally unexpected said the Dublin paper. The paper described how the two crowds had gone at each other with gusto and 'many men and youths fell in great numbers as stones and kicks rained down on the indiscriminately.... when the row was at its height, everyone was quite startled by the sound of gunfire which separated the crowds but the riot continued at a distance’. Never had a riot of such intensity taken place at a football game in Belfast. While it was commonplace for scuffles to occur at well-attended games, the extent of the violence was frightening in the extreme. Neither the police nor the clubs foresaw what would happen and there was only a small presence of constables in the ground at kick-off. As afternoon turned to evening, the sole topic of conversation at the street corners of Belfast was the riot in Celtic Park. Soldiers were confined to barracks, but put on stand-by as darkness fell and the public houses began to empty. As Saturday night became Sunday morning, an uneasy calm returned to the city. The trouble at Celtic Park had come as a bolt from the blue. Football lay in the gutter as the bloodied and battle-weary awoke with sore heads and stitches. The trouble had forced the issue of sectarianism and Belfast to the front pages of all the national papers. With two weeks to Ulster Day, the Irish question was on the lips of the opinion makers of the day. Sundays in Belfast were - and maybe are - a dour occasion. The aftermath of the rioting of the previous day still reverberated in the city, but the masses slumbered in their religious holiday while animosities were put on hold. Any fall-out from the trouble would in all likelihood manifest itself on Monday in the factories where Protestant and Catholics mixed uneasily on the work floor. On the weekend of the Celtic Park riot, Edward Carson was making final preparations for Ulster Day at the home of his good friend, and fellow anti-Home Ruler, Ronald McNeill. McNeill lived in stately opulence near Cushendun in the beautiful Glens of Antrim - a world removed from the reality of the sectarian and gritty streets of Belfast. However, as word filtered through of the riot at Celtic Park, Carson knew that the stakes had been upped considerably ahead of the historic day on September 28. Celtic and Linfield's clash had shown the extent of division and hatred that existed on the streets of Belfast over a mere game of football. 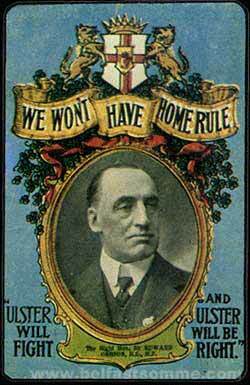 What would be the consequences across Ulster in the event of Home Rule being imposed?